Our techniques are subluxation-based. We’re going to locate the obstacles to your optimal nervous system function and work to remove them. 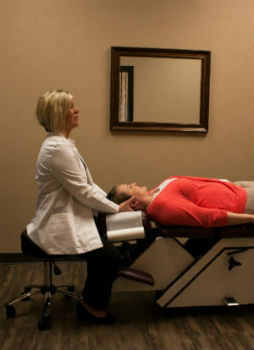 We want to re-align your spine to work at an optimal level. We don’t fit our patients to our techniques, but rather select the technique that’s right for you based off of your needs. And we see patients of all ages, including children, toddlers, and infants. Joint mobilization, like chiropractic care for the spine, is being used in the care of elbows, wrists and other joints of the body. Helping to restore normal range of motion to joints that have become “locked up”, “jammed” or injured, seems to improve blood circulation, reduce scar tissue, and speed the healing process. Joints of the body can lose their normal motion and position leading to symptoms of pain, swelling and loss of function. Many people are surprised to learn that joint pain in the hand, wrist, elbow, shoulder, ankle or knee can often be helped by chiropractic care. The doctors at Integrity Chiropractic are trained to detect and help restore proper joint function of the spine and the extremities. Like dental health, spinal health is important and caring for your spine is on-going. Your lifestyle, health habits and exercise level will determine how much care you’ll need. Whatever the case, our team will work with you so you are able to live a pain-free, healthy life. Contact us today to schedule your appointment and start your journey to better health.